The 2018 Ford F-150 has a whopping six engine options available through its seven trim levels. In fact, these trims include the XL, XLT, LARIAT, Raptor, King Ranch, Platinum and Limited. 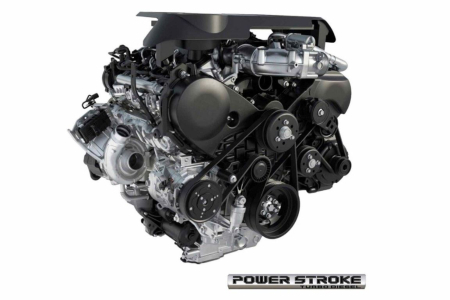 Also available in this impressive engine lineup is the new 3.0-liter Power Stroke Turbo Diesel engine. This engine is only available with the LARIAT, King Ranch and Platinum grades, and is built based on the popular 6.7-Liter Power Stroke Diesel engine found in the Super Duty model. See more: What is the difference between torque and horsepower? Further speaking of performance, these engines are paired with Ford’s advanced 10-speed automatic transmission. This new transmission replaces the old 6-speed version and offers improved overall performance and acceleration. The 2018 Ford F-150 also features Auto Start-Stop Technology, which shuts the engine off at a stop to save on fuel, and automatically restarts once the brake is released. However, this feature will deactivate when towing or in 4-wheel drive. Now that you know how powerful the 2018 Ford F-150 is, you can continue learning about the new truck by contacting us at Godwin Motors. You can also get behind the wheel of your favorite truck models by visiting our dealership in Columbia, SC, today. This entry was posted on Wednesday, November 28th, 2018 at 10:01 pm	and is filed under Ford, Vehicle Information. You can follow any responses to this entry through the RSS 2.0 feed. You can skip to the end and leave a response. Pinging is currently not allowed.